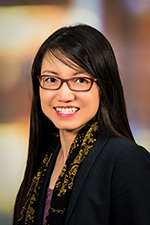 Dr. Yuan Ji is an Assistant Professor of Pathology at the University of Utah School of Medicine. She received her PhD in Molecular Pharmacology and Experimental Therapeutics at the Mayo Clinic in Rochester, Minnesota, where she further completed her postdoctoral research fellowship in Pharmacogenomics, an NIH-T32 Clinical Pharmacology fellowship and an ABMGG fellowship in Clinical Molecular Genetics. Dr. Ji received multiple early career development awards and grants, including an NIH-KL2 Mentored Career Award and a Minnesota Partnership for Biotechnology and Medical Genomics Award. Dr. Ji is board certified in both Clinical Pharmacology and Medical Genetics and Genomics. Dr. Ji’s major clinical and research focus is in Pharmacogenomics, i.e., identifying novel Pharmacogenomics markers and accurately testing, interpreting, and reporting pharmacogenomic variants. In addition, Dr. Ji also developed a vast interest in developing cost-effective diagnostic testing for diseases including somatic overgrowth and related syndromes.